A church must prepare financial statements to report its financial condition just like any for-profit business. 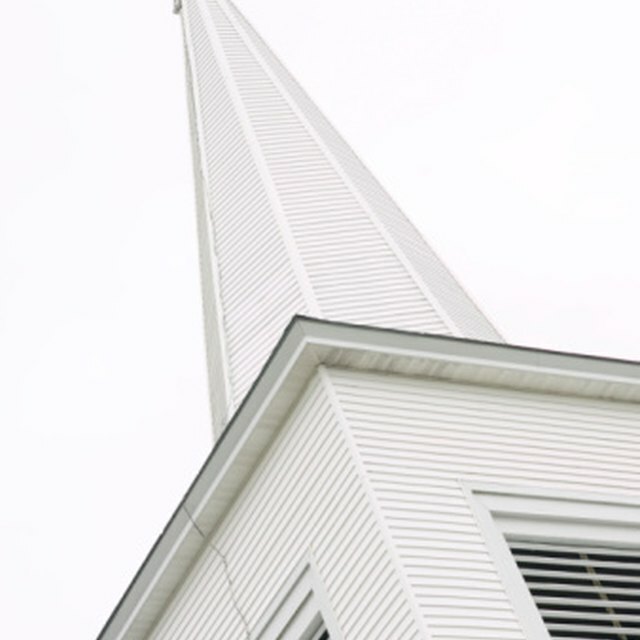 Typical church financial statements are a statement of income and expenses, a balance sheet, a cash flow statement and a fund balances report. Prepare a spreadsheet document to record a column of text descriptions to the far left and three columns of figures to the right. Summarize and subtotal the church's general fund income (undesignated donations) for the accounting period to be reported on the church financial statements. List these in far right column of your document under the heading “General Fund.” Place the summary figures in the second column from the right. Place a “Total Income” subtotal line directly beneath these, with the subtotal figure in the far right column. Summarize and subtotal the church's expenses for the same period. List these in the far left column under the heading “Expenses.” Place the summary figures in the column second from the left. Group like expenses together, and place subtotals for each group of expenses in the column second from the right. Place a total of all expenses on a separate line labeled “Total Expenses,” with the amount in the far right column. Assemble all church accounting records showing cash disbursements and cash receipts for the accounting period being reported on your church financial statements. Verify that all bank accounts have been reconciled to church accounting records. Record a beginning cash balance, then a summary of cash disbursements, a summary of cash income and, finally, an ending cash balance. More or less detail can be shown on the cash flow statement, depending on the preference of board members. Prepare a fund balances report, listing all designated funds, a beginning balance, total debits and total credits, and an ending balance for each fund. A grand total of all designated funds will be at the end of the report The report may also show the general fund balance. Prepare a spreadsheet document to receive four columns of data--a text list with subsections “Assets,” “Liabilities” and “Fund balance” to the far left--and three columns of figures to the right. Summarize and subtotal all church assets. These will include all cash accounts, investment accounts and property that is on the church books. List these in the “Assets” section of the church balance sheet. Place the summarized figures in the second column from the left. Place a subtotal on the next line in the far right column and label this line “Total Assets.” Place a double underline on this figure; it represents the first half of the church balance sheet. Summarize and subtotal all church liabilities. List these in the “Liabilities” section of the church balance sheet. Place the summary figures in the second column from the left. Place a subtotal on the next line, in the far right column of the balance sheet. List your church's fund balances in the “Fund Balance” section. The first line item in this section will be “General Fund”--consult your accounting records for a beginning general fund balance. The second line will be “Designated Funds”--take this figure from the "Total Designated Funds" line on the fund balances report you prepared in Section 2. The third line item will be “Excess Income Over Expenses." This figure will be found at the bottom of your statement of income and expenses. Place all these figures in the column second from the right. Subtotal these figures in the far right column. Label this line item “Total Fund Balance.” Underline this figure.